WAIST HIGH: Happy 25th Birthday A Flock Of Seagulls. Happy 25th Birthday A Flock Of Seagulls. The self-titled debut album from the Liverpudlian band of the same name was a concept album about alien abduction and delivered the greats "I Ran (So Far Away)," "Space Age Love Song," "Messages," and Waist High favorite "Telecommunication." Paul Reynolds' guitar work on this album was set apart from other synth-heavy acts of the time and is noted as some of the best to come out of the '80s. 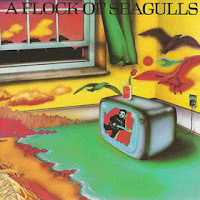 A Flock of Seagulls took their name from a line in the song "Toiler on the Sea" by The Stranglers. In November 2003 the original AFOS line-up (Mike and Ali Score, Paul Reynolds and Frank Maudsley) reunited for a one-off performance on VH1's Bands Reunited. Mike Score continues to tour under the band's name with a new line-up, but the other original members have retired from music. "STUPID HAIR ASIDE...THIS IS ONE OF THE BEST NEW WAVE ALBUMS EVER."